Searching for a truly effective remedy for eczema is often exhausting and can seem at times down right…debilitating. However, moving away from the steroidal treatments of conventional medicine toward the plant-based, anti-inflammatory solutions of herbs + aromatherapy demonstrates the successful revival of nearly forgotten wisdom. 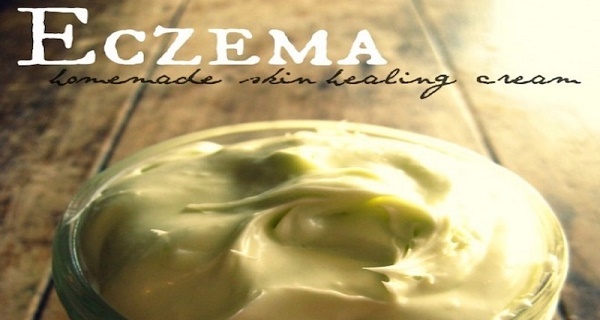 We know that eczema, by and large, is an external symptom of internal imbalance + disharmony. While the journey of correcting the underlying cause — diet + lifestyle + autoimmunity + metabolism — could take years…creating all-natural topical creams, lotions, and/or salves can provide symptomatic relief along the often difficult road. I’ve designed this herbal — totally chemical-free, all-natural, plant-based — formula to help soothe and ease extremely dry, bumpy, itchy, eczema-prone skin. Ingredients*Use only pure, organic, additive-free ingredients. I have linked to the only products I recommend. Learn more :: Click here to learn how to make your own calendula herbal oil at home. Essential Oil Blend*Use only pure, organic and/or wildharvested oils. I have linked to the superior oils made available by Mountain Rose Herbs. Combine all ingredients and essential oils — in their natural state, without the use of heat — in a stainless steel or glass bowl. Using a stand mixer or hand mixer, whip for approximately 3-4 minutes — or until well combined. Transfer cream to glass jars (I love these) for storage. Store in a cool, dark place. Apply a generous dose of this cream to the skin immediately after a bath or shower. Gently towel wet skin by patting dry just prior to application. Likewise, apply anytime to clean, dry skin whenever relief is needed throughout the day. Making remedies such as these in your kitchen requires the utmost in cleanliness in order to inhibit bacterial growth. Be sure to use thoroughly cleaned utensils, bowls, and counter surfaces throughout the process. This cream should last 6+ months on the counter. There is no need for refrigeration. This article is republished with full permission from FrugallySustainable. Do not republish any portion of this article, including photographs, without first requesting and receiving your own permission.